The third audiobook of our trilogy of Star Trek novels is available now. Narrated by Alec Newman, In the Heart of Chaos is the English translation of the original German novel. 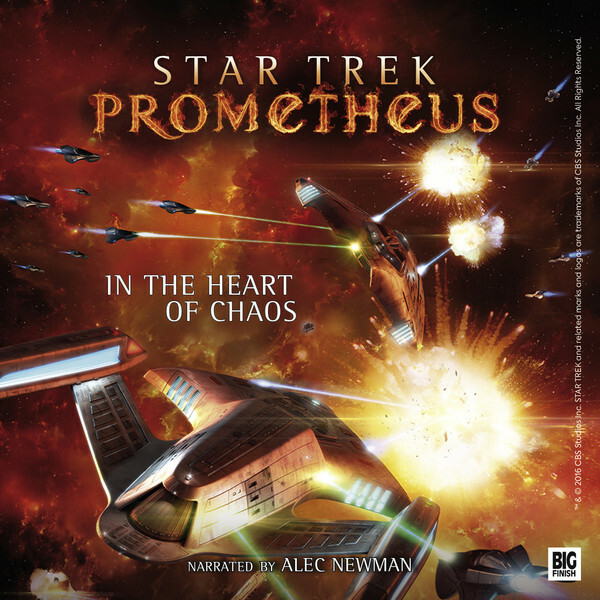 Star Trek Prometheus: In the Heart of Chaos is out now. Originally published in Germany in 2016 to celebrate the 50th anniversary of Star Trek, the Star Trek Prometheus trilogy was written by Bernd Perplies and Christian Humberg. Now translated into English, Big Finish are delighted to beam aboard the Star Trek universe and boldly take on the unabridged audiobooks of the epic series featuring the adventures of the USS Prometheus under the command of Captain Richard Adams. Star Trek Prometheus is narrated by Alec Newman, who featured as Malik in Star Trek: Enterprise. Big Finish listeners will recognise him from many other audio dramas, and we are looking forward to his return in Dark Shadows: Bloodline, due for release in April 2019. Christian Humberg agrees: “I love the English audiobooks, plain and simple. Kudos to everyone involved in their production. You have made two German wordslingers very happy… and very proud.” You can read the full article in November’s Vortex magazine. The three novels in the Star Trek Prometheus range – Fire with Fire, The Root of all Rage and In the Heart of Chaos – are available at £9.99 each or you can get all three in a bundle at £24.99. (Please note that each release is a very large download-file – be aware of any data-charges your network may incur, and that you will need twice the filestore available on your computer or device to unzip the file). Do let us know what you think of these Star Trek audiobooks, and if you’d like to hear more Star Trek stories given the Big Finish treatment, on Facebook, Twitter and Instagram.